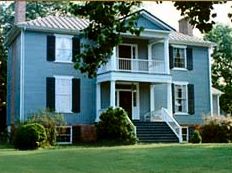 La Vista Plantation is located in the lush Spotsylvania County countryside just outside the historic city of Fredericksburg, Virginia. The National Register property reflects the classical revival style with high ceilings, wide heart pine floors, acorn and oak moldings, and 2-story front portico. The ten acre grounds present a fine balance of mature trees, flowering shrubs, pastures, woods, gardens, and a pond stocked with bass. Guests may choose accommodations in the stunning, spacious main floor bedroom with a king mahogany rice carved four poster bed, working fireplace and ensuite private bath or the Plantation Kitchen Suite with queen cherry pencil post canopy bed, sitting room, working fireplace and ensuite private bath. A second bedroom and plantation kitchen complete the offering. Antique furnishings, refrigerators, complementary bottled water, soft drinks and ice, central AC, hair dryers, radios, alarm clocks, satellite TV, VCR, video library. $135-$165 including fresh brown egg breakfast from resident hens.